Fighting in Dublin in July 1922. John Dorney reports on the public talk on June 6, 2015, ‘Establishing the Free State in conflict’ by Irish military archives at Rathmines Library, Dublin. The Irish Story devotes more attention than most Irish history resources to the Irish Civil War of 1922-23. The main reason for this is that until recently very little had been written about the conflict and many of the most elementary questions about the intra-nationalist bloodletting were unanswered. One of the main points at issue remains the number of casualties. 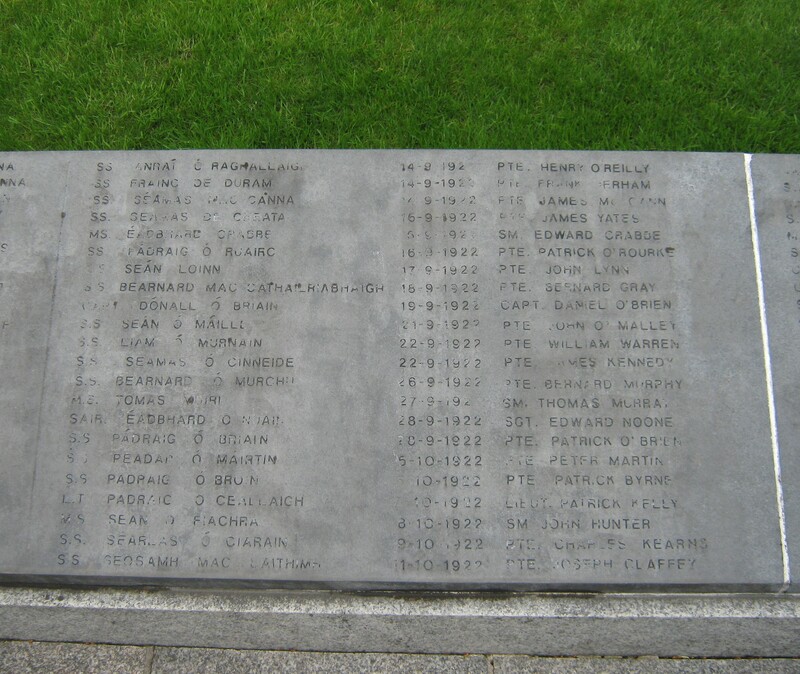 I had a go putting a figure on the civil war dead in Dublin and came up with a figure of around 220 killed in the city and a tentative estimate of 1,500 dead overall. You can read that article here. However both the available sources and the scholarship on the bloody, dismal end of the Irish revolution are expanding all the time. At this talk, Robert McEvoy of University College Dublin, who has worked with the Military Archives on the Military Pensions files, used the applications from the relatives of those killed in the conflict to establish a rough figure for fatal casualties. The Military Pension files, which have recently been released to the public and partly digitised here, contain some 300,000 files on about 80,000 people. The files at issue here (1D, 5D DP) relate to payment to dependents of those who ‘died on active service in the national [Free State] forces’ ‘following lawful orders’ and ‘not due to negligence or misconduct’. Dependents left without a source of income were entitled to a payment of 10 pounds and 26 weeks’ pay. If ‘destitute’ thereafter wives might get a widow’s pension. Approximately 600 officers and men of the Volunteers lost their lives from Easter Monday, 1916, to the 6th December, 1921, and about 800 officers and men of the Army lost their lives from the 10th January, 1922, to the 1st April, 1924. Up to date a sum of £3,909 18s. 10d. has been awarded as compensation to the relatives of deceased officers and men for the period from Easter Monday, 1916, to the 6th December, 1921, and £1,790 0s. 8d. has been awarded for the period from the 10th January, 1922, to the 1st April, 1924. The Pension awards give us some idea of who died serving in the National Army. Many had previously served in the British Armed forces, such as Jer Mahoney a British Army solider up to 1919, killed in action in Millstreet Cork on January 5, 1923, or Eugene McQuaid (a cousin of the later Archbishop of Dublin John Charles), killed in a gun battle at Newport County Mayo in February 1923, who had previously served in the Royal Air Force in the Great War. Many of the deaths in the National Army were from accidents or sickness. McEvoy stressed however that not all of these casualties were ‘killed in action’. At least 97 died in accidental shootings -whether through careless weapons handling or through nervous comrades. Many others died of sicknesses, such as pneumonia or tuberculosis brought on by garrisoning drafty, unheated posts, and other died in road accidents, drownings or other mishaps. Robert McEvoy cited the case of two Privates, Moose and Kenny, who drowned near Mallow trying to swim back to their barracks after a night’s drinking (due to the men’s ‘negligence’ their relatives were not awarded a pension). So the total of non-combat related deaths may be as high as 2-300. This would leave 6-700 who did die in action -a surprisingly large total in some ways considering the low-intensity character of the civil war after the autumn of 1922. Moreover McEvoy stressed that these are minimum figures since some families may never have applied for pensions. On the other side, relatives of anti-Treaty IRA combatants were also entitled to claim for compensation for the death of family members after 1934. When asked, Patrick Brennan of the Military Archives at Cathal Brugha Barracks, replied that this data still has to be fully analysed but that there are about 500 such claims – confirming incidentally, what local studies have been showing, which is that the pro-Treaty forces suffered more casualties than their ‘Irregular’ opponents. The death toll of the 1922-23 conflict is likely to be a little under 2,000 people. This gives us a rough total of 1,400 combatant deaths, meaning that once civilian deaths are added – my estimate is roughly 2-300 – the final death toll still hovers somewhat below 2,000. Although these are minimum figures and even allowing for many more as yet undiscovered casualties it still seems as if the civil War was in fact slightly less bloody than the preceding War of Independence, whose death toll was counted as 2,100 by the Dead of the Irish Revolution project. A final note; Robert McEvoy also showed how the Pension files can be used a historical source. The atrocities of the Civil War, for example at Ballyseedy in Kerry and in South Wexford (see here) in March 1923 for instance, are only fully detailed in the pension files, where relatives had to disclose the manner of death of their kin and their statements were checked and cross-checked for accuracy. Overall this was a very informative talk and the Pension Files will certainly advance our knowledge of this dark and often forgotten period. Written by: John_Dorney on 22 June, 2015.on 23 June, 2015.